Polycomb Repressive Complex 2 (PRC2) is essential for gene silencing, establishing transcriptional repression of specific genes by tri-methylating Lysine 27 of histone H3. In spite of its biological importance, little was known about PRC2 architecture and subunit organization. We have reconstituted a tetrameric human PRC2 complex (Ezh2/EED/Suz12/RbAp48) with its cofactor AEBP2 and obtained the only available structural description of the complex (20 Å resolution). 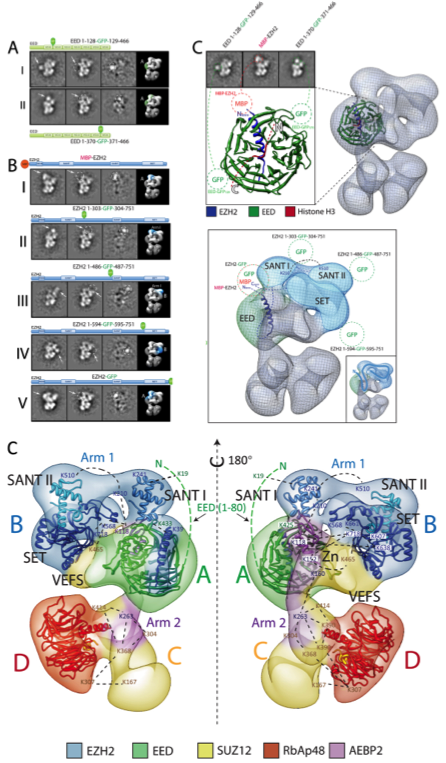 We used a tagging strategy to position all functional domains within the complex that showed that the Ezh2’s SET domain forms a core with the two activity-controlling elements, the WD40 domain of EED and the VEFS domain of Suz12. How PRC2 interacts with nucleosomes, or its interaction with ncRNAs are among our next goals. Claudio Ciferri, Gabriel C. Lander, Alessio Maiolica, Franz Herzog, Ruedi Aebersold and Eva Nogales (2012) Molecular architecture of Polycomb Repressive Complex 2. eLife, 1:e00005 Oct 30 2012 Epub.